"El compositor y pianista Ralph Zurmühle ha conseguido el reconocimiento de la prestigiosa web estadounidense Solopiano.com, al ganar el premio Álbum del año, además de obtener el premio específico a la categoría Contemporary and Modern. Reflections es un disco grabado con AvantGrand en el que Ralph Zurmühle consigue unas texturas sonoras cálidas e íntimas, con unos niveles de inspiración que atrapan al oyente durante toda la obra y que evocan matices relajados y profundos. Reflections explora la sonoridad del piano de manera magistral y alcanza una dimensión técnica y artística solo alcanzables por las mejores obras de piano contemporáneo." " 'No podemos ver nuestro reflejo en el agua que corre…' Este viejo proverbio taoísta es el lema del nuevo CD de Ralph Zurmühle. Pero el movimiento, veloz, intrigante, imparable, parece ser el tema predominante en la mayoría de las piezas del disco. Tomen, por ejemplo, el intensamente hermoso Dreamesque. Se trata de una música que parece estar girando, girando, frente a nuestros ojos-oídos, como una plateada bola de Navidad que lenta y deliberadamente refleja nuestros rasgos y luego sigue moviéndose y reflejando luces brillantes, lugares perdidos, espacios desolados, paisajes imaginarios, habitaciones recordadas a medias, y luego nuestro rostro de nuevo, girando lentamente, girando siempre… Esta música nos trae un intenso, exquisito sentimiento de alerta, de responsabilidad, de contemplación, de maravilla, de nostalgia. Todo el CD está lleno de este sentimiento de nostalgia por una dimensión perdida del alma. Da la impresión a veces de que el piano no es realmente un instrumento, sino una voz. Es imposible traducir en palabras lo que esa voz dice, pero atraviesa el corazón y cura la herida al mismo tiempo. Esta obra, producto de un trabajo intenso, cuidadoso y refinado, tiene un origen evidente en la improvisación, y conserva todavía esa sensación de espontaneidad de la música improvisada. Posee la cualidad hipnótica de los fenómenos naturales: un fuego ardiendo, un arroyo que corre, unos abedules agitados por el viento, y se escucha con la misma facilidad y concentración con que uno escucha o contempla la naturaleza. Lleno de sutiles cambios de matiz y de tempo, Reflections es el mejor disco de Ralph Zurmühle hasta la fecha. Reflections suena como una gran declaración personal, más profunda y quizá incluso más variada que cualquier otra cosa que el pianista y compositor suizo haya creado nunca. Escúchelo, y probablemente recordará algo que ni siquiera sabía que había olvidado." 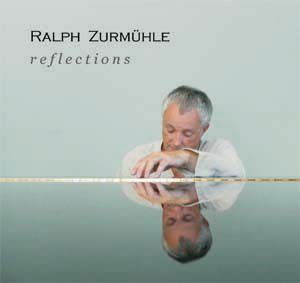 "Ralph Zurmühle is one of the finest contemporary piano composers on the planet. His poignant works appeal to a wide range of listeners, including classical music aficionados, but he has been known to cross many lines and many genres. His latest offering, Reflections, is not just about things done with mirrors. There are many kinds for reflections for his purposes. There are pools for reflection, times for reflection, and minds that are filled with reflection. Zurmühle's intention is to allow every kind of reflection imaginable to flourish with the help of his music. On this album he is completely successful. No matter how many times I played the album, which was considerable, I always returned to the song Deep Waters. To me it had not only a Brubeckian feel to it, but also a great deal of pathos. What emotions can we expect to find when we plumb the blue depths of a human soul? Ralph measures that depth with his somewhat somber melody, but somehow the outcome has a promise in the end. All is not lost. Dreamesque is the longest track on the album at over twelve minutes, and perhaps it is its most heartrending. It creates a place where the music invites your mind to wander. The melody is a haunting, moody refrain that builds a world of slippery shadows, revolving mirrors and rows and rows of closed doors. The music dares you to open a door and behold the contents. Then what do you do? In this day and age, bells in Japan ring out for peace, but it was not always so. There was a time when they rang out a warning, a resounding caution that touted danger and symbolized the pain and anguish that was to come. It was a time of war. Ralph's beautiful composition, Chimes For Tsuyo, is a melancholy tune that resonates with an ageless sorrow. The song, with the sound of echoing bells, was inspired by a black & white image. It would have been uncomplicated if not for the shadows of suffering etched into the face Tsuyo, a survivor of Nagasaki. Now it is a stark reminder of not what to do. Ever. Inside the cave it is cold. Water drips from stalactites and forms puddles on the floor. Reflected in the pools are dancing flames, and huddled in a corner is an old crone. Or so she seems. For, unfolding like the petals of a spring flower, this beautiful woman has the knowledge of the ages and if you are worthy, she will reveal more than you care to know. Such was the imagery provided by the tune The Oracle . The song is alluring and provocative and Ralph performs it with Mediterranean flair. I listened to Under the Old Oak Tree with captive interest. I have the habit of sitting under the pin oak in the yard and watching the world go by. I can look up through the branches and stare at the sunlight as it splinters in the shadowy leaves and I can feel the warm breeze as it moves over the land. The boughs embrace me like wooden arms, and I feel like a part of nature, something mysterious that regulates the seasons. Every Ralph Zurmühle album is, if anything, precise. Every detail attended to. The cover art is simple, yet refined. On Reflections, the cover is apropos. The contemporary piano music is evocative and yet musically flexible. You can be in any kind of mood and the music will seek you out and complement your feelings and it will add stimuli to your senses. In other words, it does its job superbly. Rating: Excellent." Reflections begins with La Plana, a nine-minute exploration that slowly and gracefully tells a story of great beauty and peace - a true reflection. This album is dedicated to Zurmuhle's father and the second track is a loving tribute called My Father's Eyes. Zurmuhle paints a musical portrait of a man with a sparkle in his eyes, a light-hearted good humor, and a zest for life (my own interpretation, of course!). Deep Waters is amazing. Clocking in at a bit over ten minutes, it tells a vivid story of vastness, dark mystery, perhaps an element of danger, and many other moods and motions of the ocean. A jazzy section could be light dancing on the water or lively sea life or maybe just the movement of the ocean current. The last couple of minutes become much more peaceful and calming - beautiful! The Oracle has a very Middle Eastern flavor that is both dark and intense. Zurmuhle's incredible technique and mastery of the piano is especially apparent in this piece - what control and expression! Chimes For Tsuyo (Hibakusha, Nagasaki) has a mournful and tragic tone that continues to haunt long after the piece is over. Under the Old Oak Tree is a blissful daydream set to music. Warm, soothing, and very relaxing, it's a gentle massage for the mind. The 12 1/2 minute Dreamesque is my favorite track. A repeated rhythmic pattern gives the piece a hypnotic pulse while the other hand is fluid and unpredictable - sometimes melodic, sometimes ethereal, sometimes barely a whisper. Breathtaking! 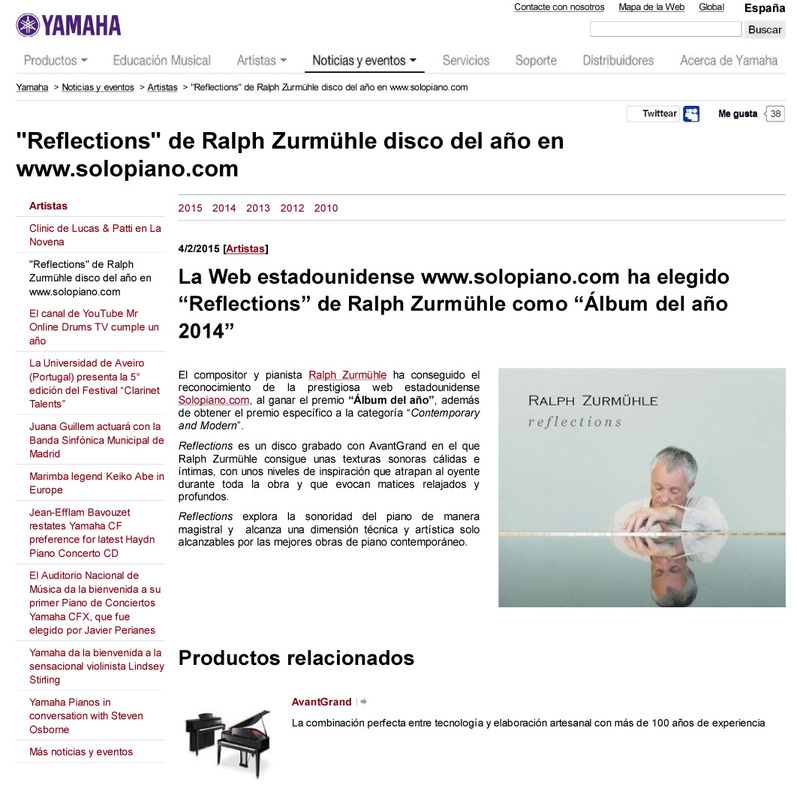 If you are new to Ralph Zurmuhle's music, Reflections is a great place to start! Sure to be one of my Favorites for 2014, it is available from Amazon, iTunes, and CD Baby. I give it my highest recommendation. "Tras el éxito de eQuinox, Ralph Zurmühle regresa con un álbum más íntimo, mucho más emocional. El quinto álbum de estudio de Zurmühle no es más que la ventana abierta, sin prejuicios, a las emociones más introspectivas del compositor. Intangibles impresiones que se transforman en algo palpable gracias a melodías que doblegan al silencio a su antojo, juegan con él, se recrean con él, improvisan, dejando que el oyente se aísle por completo en su propio mundo, en sus propias incertidumbres y pensamientos. Reflections, que mantiene el estilo afectuoso de los álbumes anteriores de Zurmühle, está recogiendo grandes comentarios por parte del público y la crítica, uniendo impresiones de lo más favorables que no hacen más que confirmar el dominio que posee el pianista para conectar con el público a través de sus obras de solo piano."